Run – do not walk – to your nearest “Big Lots”! 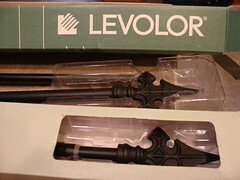 I found these Levolor rods for only $7.95! They are black wrought iron with a very nice weight to them. A very nice change to the ordinary plastic rods that you see at most places! Because we need to hang curtains on all of the windows in our home, I know how costly curtain rods can be! I was so happy to find these, as they are cheaper than the smallest rods at the nearest “big mart”! I took the picture with the rod ends in front of a darker fabric (the front of my organizer) so that you could see how beautiful they are close up. Here is what they look like in the package. 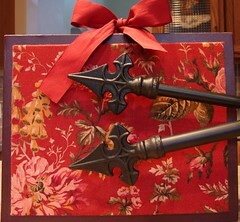 I am getting ready to make new curtains to hang on these lovely rods & I will post the progress of those very soon! Thanks for the tip! I have to drive past there today and will stop in. Your organizer is sooo pretty. Did you make it? I love the rods you found. I was looking at some that are similar in Jcpenney and they are $30.00 or more. I will have to go to Big Lots. Thank you. Thanks! No – I didn’t make it, but I want to make several – as I LOVE this one! It would be simple to do. On the front of any pocket organizer add – a panel of the fabric of your choice (backed with a piece of cardboard), and a pretty ribbon to the top for closing.